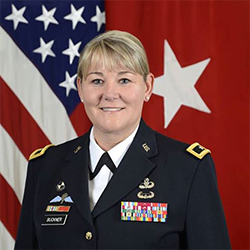 Brigadier General Jennifer G. Buckner assumed her present duties as Director of Cyber, Electronic Warfare, and Information Operations, Headquarters Department of the Army G-3/5/7, in July 2018. She previously served with U.S. Cyber Command as Deputy Commander (Operations), Cyber National Mission Force, and Deputy Commanding General of Joint Task Force ARES, from June 2016 to June 2018. A native of Downers Grove, Illinois, BG Buckner is a 1990 graduate of the U.S. Military Academy at West Point. As a career intelligence officer, BG Buckner has held command and staff positions across all levels of the Army with assignments in the United States, the Republic of Korea, Puerto Rico, and Iraq. BG Buckner has commanded a company, battalion, and brigade, including the Army’s first Cyber Brigade. She served as the first U.S. Army Cyber School Commandant and Chief of the Army's Cyber Branch. BG Buckner has served in Joint and Army assignments in the United States and Iraq. Her most recent overseas posting was as a Battlefield Surveillance Battalion Commander supporting Multi-National Corps – Iraq.